How a wave of retirees and a changed economic landscape reshaped rural politics. A respectful hush falls over the living room of this large house just outside Walsenburg, Colorado. Members of the Huerfano County Republican Party have gathered here to celebrate President Donald Trump’s Inauguration, while a recording of the day’s events is projected on a tall wall. In the kitchen, a tiny jar of caviar sits among cheese platters and steaming crockpots on the granite countertop. Debi Sporleder, the party’s chairwoman, bows her head and prays. A chorus of “Amens” follows. Chairs scrape the floor as people rise for the Pledge of Allegiance. Though the mood of this mostly older crowd is quiet and far from jubilant, tonight is a celebration. Bolstered by transplants and new recruits, a resurgent local Republican Party mounted a formidable opposition last year to the Democrats, who had for decades enjoyed wide support in this former coal town. Local Republicans, led by Sporleder, mobilized voters, worked the phones, and manned Republican Party headquarters — the first in town in recent memory. Their efforts contributed to a surprising political about-face: Huerfano County voted red in the 2016 presidential election, departing from its long Democratic history to support Donald Trump over Hillary Clinton by a margin of about 10 points. Whether the flip is a fluke or a harbinger of long-term change is more than just a political question for Huerfano County: It’s a reflection of the community’s past and, perhaps, its future. The Huerfano County GOP celebrates on Inauguration Day. In some ways, the story of Huerfano County mirrors national trends. As in other rural places, Trump’s rhetoric tapped into frustration with the slow pace of economic recovery in Walsenburg — at 3,000 people, the county’s biggest town — and appealed to people’s fear of law-breaking or welfare-dependent immigrants. But the county’s embrace of Trump is also due to fervent local organizing and the demographic changes that have quietly remade Huerfano County and dozens of Western communities over the past few decades. What began as a trickle of retirees and second-home-owners seeking cheap land has become a powerful force here, making the place more retirement destination than working-class haven, more drive-through gas stop than self-powering economic engine. Now, six months after the election, the community is still grappling with the potential implications of Trump’s policies and the ripple effects of the political shift on local elections. The way Walsenburg handles its changing identity — whether the locals succeed or fail to understand each other in a political environment that is more heated and more vicious than ever before — may offer a forecast, of sorts, for other communities dealing with the same thing. And though the county’s swing for Trump surprised many, the embers of this political transformation have been below the surface for decades, steadily burning like coal. Phyllis Cordova grips a mug of coffee on the laminate counter in the café she has owned in downtown Walsenburg for four decades. A television news program prattles on about a pending snowstorm on this January morning, but inside the Alpine Rose Café, it’s warm, brightly lit and nearly empty. Just one person sits alone at a table in the back. Cordova, a Democrat, is the daughter of a coal miner, and she talks wistfully about how life once was in her native Walsenburg. In 1940, 6,000 people lived in town, and another 10,000 in the surrounding county. Now, there are only 6,000 people in the entire county. Cordova counts off the car dealerships and bars that once lined the busy streets. People were miners or ranchers, or they drove to Pueblo, an hour away, to work in a steel mill. Jobs paid good wages and required just a high school degree. 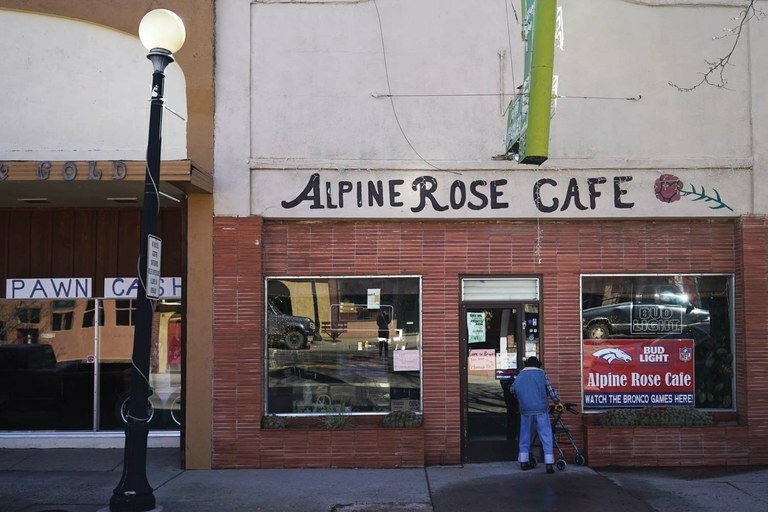 The Alpine Rose Café was a booming business in downtown Walsenburg when Phyllis Cordova bought it in the 1970s. “Now, all the old-timers are gone,” she says. Walsenburg has an important chapter in the labor history of the U.S. In the 1860s, the community was called La Plaza de los Leones, a regional hub for Spanish-American ranchers and farmers. Fred Walsen, an early settler and the town’s namesake, established a trading post in the area in 1870, and the town was incorporated in 1873. Later that decade, the first coal mine opened. As immigrants flooded the Eastern U.S. in the late 1800s, hundreds of them boarded trains headed west and landed here. “They were the start of the middle class,” says Bob Butero, Western regional director for the United Mine Workers of America. Labor leader Mary “Mother” Jones famously spent time in the Huerfano County jail after she tried to help striking miners in the early 1900s; local Democrats still re-enact her dramatic arrest at a dinner held in her honor each year. Steeped in the town’s collective memory is the 1914 Ludlow Massacre, which erupted when members of the Colorado National Guard opened fire on striking coal miners on the prairie outside Walsenburg. At least 19 people, including 11 children, died in the resulting chaos, and the daylong shootout ended with the strikers’ tent colony being burned to the ground. 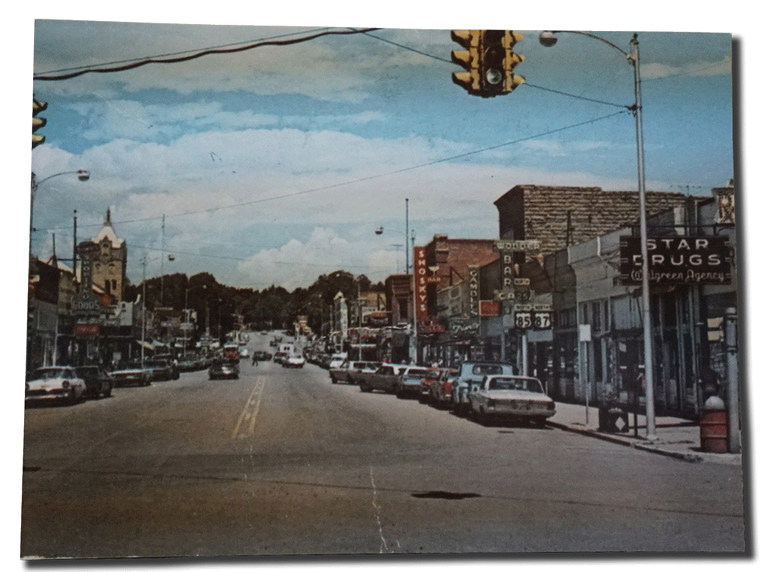 A bustling downtown Walsenburg, c. 1960s, as seen in a photograph in the Huerfano Heritage Center. For several generations, mine workers protested the horrific working conditions; GOP-leaning mine bosses fought back. The cycle bred a sense of contempt that still makes some old-timers cringe when they hear that their granddaughters are marrying Republicans. Voting Democrat is part of the DNA of Huerfano County, where locals supported Jimmy Carter, Bill Clinton, Al Gore and Barack Obama, twice. Since 1944, the county has voted for just two Republican presidents: Richard Nixon in 1972 and George W. Bush in 2004, by a margin of 45 votes. But machines replaced workers, demand for Huerfano County coal declined, and the mines left one by one; the last one closed around 1973. As coal left, much of what made Huerfano County blue left, too, setting off the first cracks in the Democratic machine and changing the culture of the county. Despite her nostalgia, Cordova doesn’t mind the slow days at the Alpine Rose Café, she says. She’ll linger to chat with customers, or feed a family member who stops by after school. She keeps a table stocked with free clothes for those who need it. A man walks across the street in Walsenburg, where population has dropped by about half and businesses are struggling. 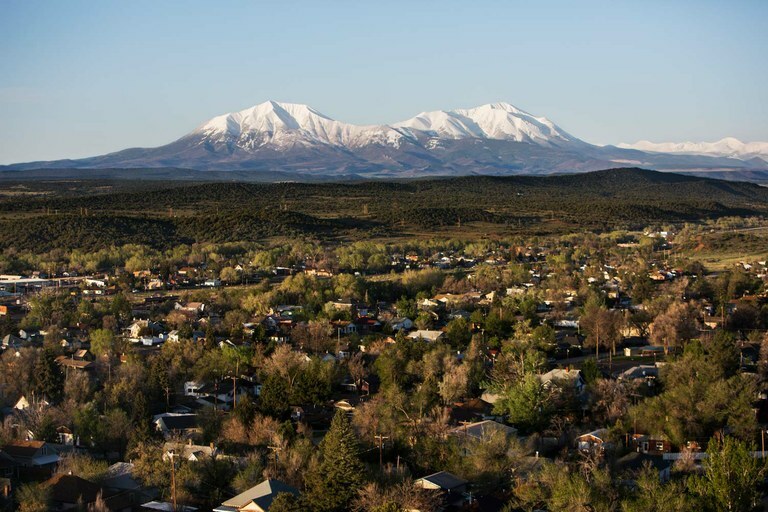 Walsenburg is a quiet place now, a grid of old houses stuck stubbornly to wind-swept land between Interstate 25 and the Spanish Peaks, twin mountaintops that rise like church towers south of town. 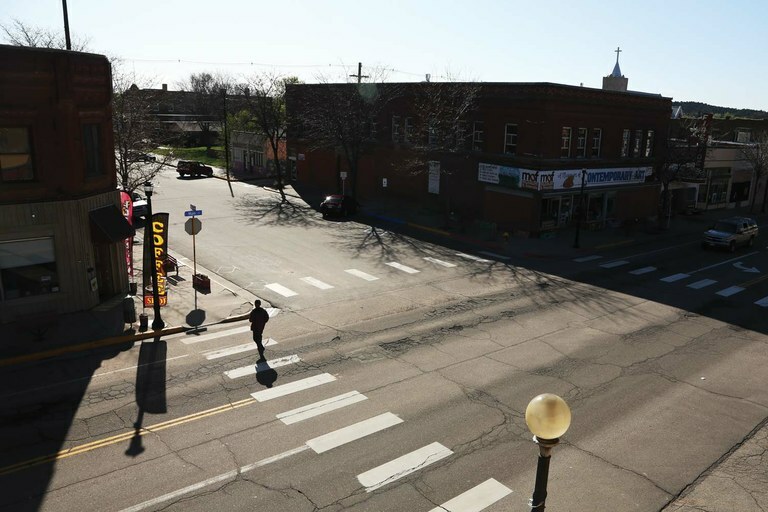 Main Street is just a few wide blocks, trains stop traffic and tumbleweeds gather in the doorways of vacant buildings. A new coffee shop sticks out, one of the few places where tourists mingle with locals and the young sit with the old. The outskirts of town quickly give way to open space, where mobile homes and mansions cling to the sloping foothills. Like many small Western communities, Huerfano County has lost many of its kids and working-aged adults; young people tend to move away for jobs and college and not come back. Schools have consistently shrunk in the last decade. At a recent community meeting, in hopes of improving the county’s teacher turnover rate, the school district superintendent urged local businesses to offer incentives for local teachers — maybe coupons for pizza or a few free rounds of golf. But there is one bright spot in the otherwise depressing data: Retirees love Huerfano County. Though population overall has plummeted nearly 20 percent since 2000, the 65-and-older age group has grown by more than 500 people or 10 percent. One in three people in Huerfano County are baby boomers, compared to one in five nationally. 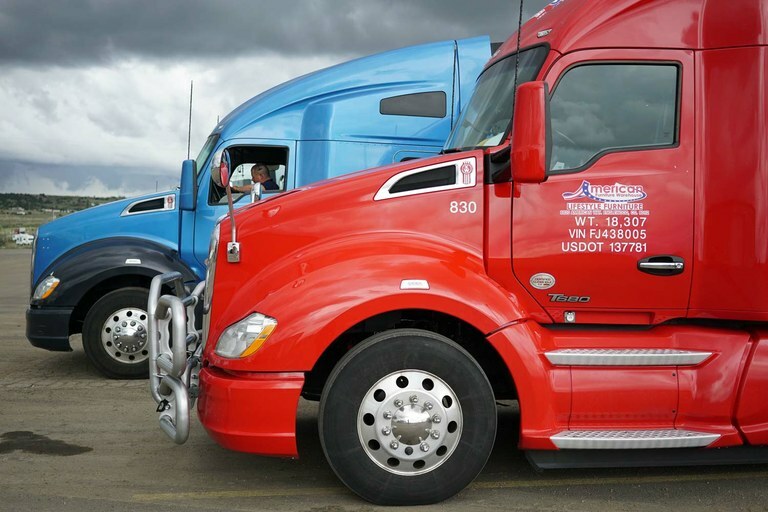 Across the Mountain West, retirees are flocking to communities like Walsenburg, according to research from the Bozeman, Montana-based Headwaters Economics. 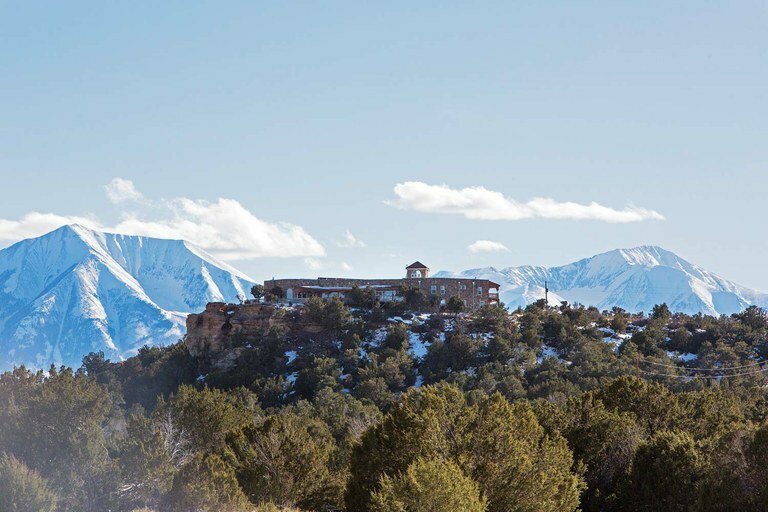 The Spanish Peaks are a backdrop to the 12,500-square-foot home of retiree Stanley Mann outside Walsenburg. To be sure, retirees are not the only demographic force reshaping the rural West. Tourism and the boom in remote employment are transforming local economies, too, with different political implications. Think Jackson, Wyoming, where the dearth of affordable housing means teachers and cops commute from 30 minutes away, and Bozeman, Montana, where tech firms are hiring scores of workers and manicured subdivisions are swallowing farmland on the outskirts of town. 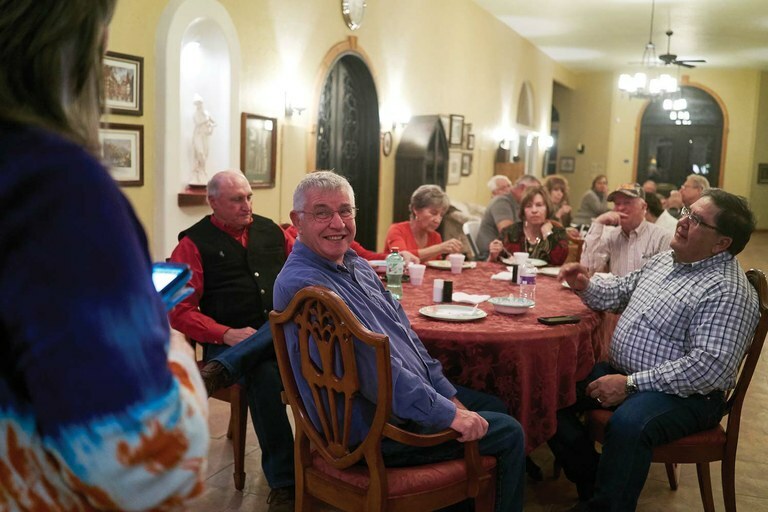 In Huerfano County, retirees are making a new kind of economy, with caretaking as its primary industry; there are more jobs here in health care and social assistance than in any other sector except government. The city has embraced this shift in some ways, including changing zoning regulations to allow tiny homes in hopes of attracting retirees who want to live cheaply in 600 square feet or less. Their arrival is also reshaping the politics of Walsenburg and nearby towns. Today, there are more registered Republicans in Huerfano County than in any presidential election year for which data are available since 1968. Democrats still outnumber Republicans almost two-to-one, but the gap is narrowing; there are three times as many registered Republicans now than there were in the late ’80s, and a third fewer Democrats. That statistic sneaked up on the town. “I didn’t see it coming,” Carolyn Newman, a Democrat in her 80s, says of Trump’s win. Newman, a retired schoolteacher and mother of the local sheriff, moved to Walsenburg in 1957. To Newman, two things seemed different about this election: People were more opinionated and bitter, she says, and the local Republicans were more active than ever before. 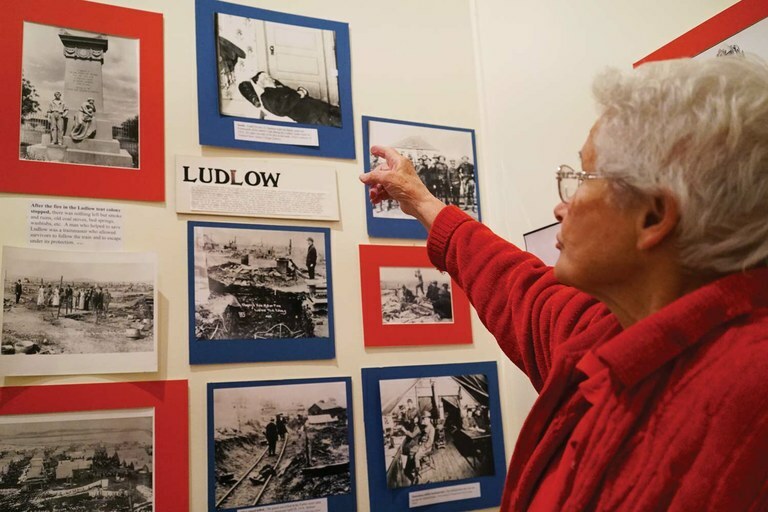 Carolyn Newman recounts the history of the Ludlow Massacre at the Walsenburg Mining Museum. Debi Sporleder wraps her arms around her lanky 11-year-old grandson, Elijah. “I need you to practice for a half hour,” Sporleder, 57, says in his ear. Elijah nods, knowing, as Sporleder does, that he hasn’t rehearsed enough for the next day’s clarinet lesson. The family’s terrier, Kody, trots around the living room, whose walls are adorned with multiple crosses. Debi, a Kansas native with bright blue eyes and wavy graying hair, married into the Sporleder family, whose roots in Walsenburg go back four generations and include this tan stucco house a stone’s throw from downtown. She met her husband, Karl, at a gun-smithing school in Colorado. Debi Sporleder watches coverage of the Trump Inauguration at her day job at the local newspaper. As chairwoman of Huerfano County GOP, she helped turn her county from blue to red. Sporleder never expected to be a mother again, not after raising kids of her own. But when her daughter ran into hard times, Sporleder didn’t think twice about taking in her grandson. 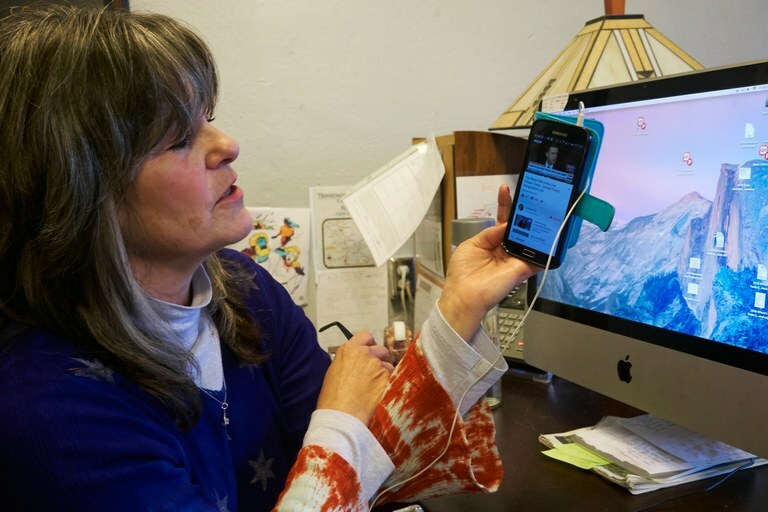 Her days are split between her job as sales manager for the local newspaper, the tasks of motherhood and her newest pursuit, also a surprise to her: chairwoman of the Huerfano County Republican Party. Between her disdain for professional politicians and her frustration with what she saw as the corrosion of conservative values, she was fed up with the Republican Party. But Sporleder, the daughter of two entrepreneurs, was raised to do more than just complain when she dislikes something; she believes in working to change things. So when the former party chairman stepped down, she volunteered to take his place. As is true for many local Republicans, Trump wasn’t Sporleder’s first choice. She preferred Ben Carson, Sporleder says, though Ted Cruz was the favorite among local Republicans. But she liked Trump’s opposition to undocumented immigrants and the Affordable Care Act, which she despised, although her own coverage comes through a private religious agency. “I was so offended to think that I have to have the type of insurance that they want me to have,” she says. In the end, Sporleder’s decision to vote for Trump involved more of a moral calculus than the political kind. A devout Christian whose religion is a guiding factor in her life, she wanted a candidate with strong conservative values. A memorial to its prosperous coal-mining past stands watch over sleepy downtown Walsenburg. Sporleder became a driving force behind Huerfano County’s unlikely support of Trump last year: a Republican Party more organized than ever before. Her success shows the influence that even a few motivated people can have in small towns like Walsenburg. She recruited volunteers to staff the campaign headquarters, whose storefront windows were plastered with signs for Trump and local Republican candidates. Sporleder says that tourists from as far away as California stopped in for a free hat or bumper sticker as they passed through town. Marcy Freeburg, a former local party secretary and Republican candidate for the Colorado House of Representatives, got hold of 100 Trump yard signs to give away at headquarters, first come, first served. Sporleder and others revived the Republicans’ sleepy Facebook page, posting daily updates on early voting turnout. The party’s social media messaging scourged Clinton as much as it hailed Trump: One photo on its Facebook page shows Freeburg wearing a Hillary Clinton mask and bright orange prison jumpsuit, in front of a “Make America Great Again” sign. Sporleder organized a showing of the controversial documentary Hillary’s America: A Secret History of the Democratic Party at the local theater; about 100 people showed up. Ads for the event promised free entry for Democrats, though Sporleder doesn’t think anyone took advantage of that offer. The messaging swayed voters, and motivated some who hadn’t voted in years. But all that organizing worked partly because the once-steady economic ground in Walsenburg had shifted underfoot. Trump’s grim picture of America — decaying infrastructure, failing schools, an economy that can’t create full-time, high-paying jobs — resembled Huerfano County enough that, despite Trump’s lack of a detailed plan, plenty of people in Huerfano County agreed with his arguments. Marianne Smithey, 62, a Trump supporter who owns an antique store downtown, was downright suspicious of recent employment data that showed strong economic growth. Where, she asks, is that growth in her own town? “I didn’t trust any numbers that (Obama) ever spoke about, because I lived in a place where I didn’t see it happening,” Smithey says from behind the counter at her store one Friday afternoon in January. No customers mill the aisles. Smithey has a point: Recovery from the Great Recession has been slower in rural places. Jobs in small towns have been growing at less than half the rate of cities. Growth in Huerfano County has been similarly grim: The number of jobs outside the public sector and health care has dwindled in the last decade. A couple industries — a private prison, a firesuit manufacturer — have come and gone since coal’s exodus, but nothing has brought the same prosperity as mining. Compared to Denver, about 160 miles north, where the population has soared 17 percent since 2000, many in Walsenburg feel left behind. Trucks at a Shell truck stop in Farista, just outside Walsenburg. Walsenburg city councilman and tow-truck operator Greg Daniels is a lifelong Democrat whose property has in the past hosted the party’s headquarters. But last year, Daniels turned down the Democrats’ request to do so again. He thought Clinton was too friendly toward the Wall Street investors who contributed to her campaign, and he didn’t want Clinton signs on his land. Huerfano County Sheriff Bruce Newman, also a lifelong Democrat, was so disenchanted with politics last year that he didn’t support either major party candidate. Among a series of cartoons pasted on his office door — some praising the Second Amendment, one ridiculing Sarah Palin — is a cartoon of an infant preparing to punch Clinton. It was put there long before she ran for president. “Our big joke was, ‘I’m just going to write in my own name,’ ” says Newman. He is not the only voter in Huerfano County who despised Clinton more than he feared Trump; some analysts say that disaffected Democrats like Daniels played a huge role in Trump’s win. One political firm blamed Clinton’s loss nearly entirely on voters who backed Obama in 2012 but supported Trump four years later; a New York Times analysis estimates that almost one in four of Obama’s white working-class supporters ditched Clinton to vote for Trump or a third-party candidate in 2016. 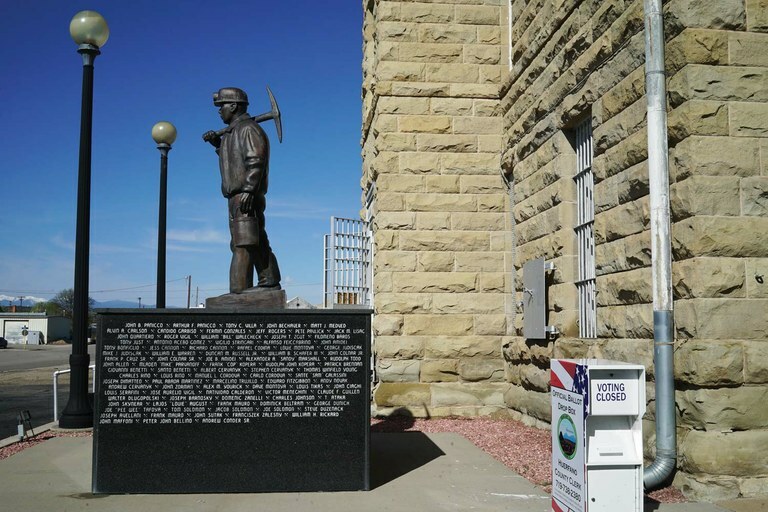 Once a Democratic-leaning coal-mining town, Walsenburg, Colorado, voted Republican in the 2016 election, in hopes of bringing back a vibrant economy. On Nov. 8, 2016, Sporleder cast her vote for Donald Trump, along with 1,882 other Huerfano County residents. 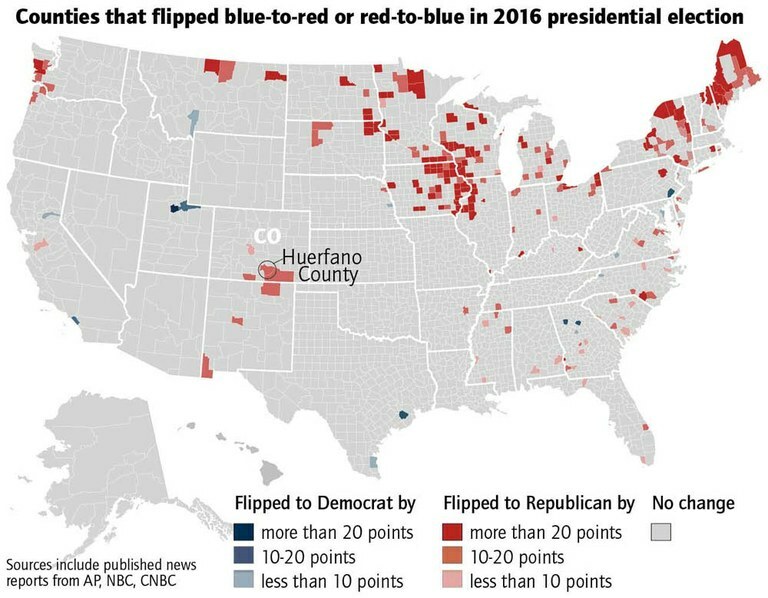 The results demonstrate the extent to which the Democrats have lost ground here: Even if all 1,234 registered Huerfano County Republicans voted for Trump, about 600 Trump votes must have come from outside the party, from Independent or Democratic voters. Trump’s margin of victory grew as voting populations got smaller: Nearby Las Animas and Conejos counties, like Huerfano, flipped from backing Obama in 2012 to voting for Trump last year. Exit polls show that rural voters across the country tended to vote Republican even more in 2016 than they did in 2012 and 2008. Many local Democrats are now asking: Was the county’s support for Trump just a blip, or a sign of more lasting change? The shift from blue to red was far from unanimous. Huerfano County voters supported Democratic Sen. Michael Bennet by about 300 votes, for example, and they voted to increase the state’s minimum wage. But registered Republicans are on the rise and are beginning to flex their muscle. Huerfano County voted for Scott Tipton, the Republican candidate for the U.S. House, and supported a Republican for state senator. Since 2012, two of the three Huerfano County commissioners have been Republicans. Both Max Vezzani, a descendent of Italian immigrant coal miners, and Ray Garcia, a fifth-generation Huerfano County resident, were re-elected last fall, and received more votes than before. Prior to Garcia’s election, he says, there hadn’t been a Republican commissioner in his district for 75 years. From its office in an old downtown storefront, the Huerfano County World Journal dutifully chronicles local life. Few on the outside, however, know how the presidential election played out inside the newsroom, among a staff that spans the political spectrum. On one end lies Sporleder, the Republican Party chairwoman, and on the other lie Gretchen and Brian Orr, the newspaper’s publishers and Sporleder’s sister- and brother-in-law. The staff has one rule, which reflects how the town seems to be handling its changing political landscape: They do not talk about politics. Just as Republicans, thrilled by their newfound political power, are working to sustain momentum, local Democrats are scrambling to find it. Orr sat in on one of the Democrats’ first meetings after the election, where local Democrat Mark Craddock tried to reel in a scattered conversation about the group’s new mission statement, and discussed how to bridge the growing political divide. Local Democrats are also studying the Tea Party’s strategy for effecting policy change, including bringing more people to city and county meetings, especially Independents, and increasing their social media activity. Huerfano County Republicans, meanwhile, like what they see so far, despite the rocky progress on Trump’s health-care bill, the turmoil and turnover among White House leadership, and now the appointment of a special counsel to investigate Russian efforts to influence Trump’s election and the extent of the Trump campaign’s involvement with it. Mann said in January he hadn’t heard that Trump’s controversial immigrant and refugee travel ban left out several Muslim-majority countries where Trump does business — Saudi Arabia, for instance, home of 15 of the 19 hijackers involved in the Sept. 11, 2001, attacks. “It would depend on who said it, if I believed it,” he said. Sporleder isn’t discouraged, either, even though Trump has yet to make good on his campaign promise to repeal and replace the Affordable Care Act. “I believe he’s trying,” she says. As for Trump’s ties to Russia? Sporleder says there’s nothing there, that the special counsel appointed to look into the issue is more evidence that politicians are trying to thwart Trump any way they can. “I just trust that he will do the right thing,” she says. Walsenburg Republicans differ over what, exactly, they hope Trump will accomplish. None could say how they think he should restore jobs. One said she hoped Trump would give money to the elderly, to help fix their homes. Vezzani, one of the two Republican county commissioners, is skeptical that Trump will change anything in Huerfano County. After all, it was market forces that shuttered the mines in Huerfano County. Federal data show mining has been shedding jobs for decades, under presidents of both parties. And despite Trump’s pulpit-thumping about how he’ll rescue manufacturing jobs lost to cheaper labor overseas, research suggests that Trump’s favorite villains — globalization and immigrant labor — are not the biggest factors behind the loss of manufacturing jobs. In fact, as many as 88 percent of those jobs have been lost to automation. U.S. factories are producing more than ever before, simply using fewer people. And in Walsenburg, those jobs were never the backbone of the economy, anyway. “We’re not the Rust Belt,” Vezzani says. In fact, much of Trump’s current agenda could do more to harm than help the rural communities like Walsenburg that elected him. Trump wants to eliminate the federal grant program that helped pay to convert the first story of a historic school building into the town’s only library. He proposed cutting a federal airline program that keeps flights to rural places, including nearby Alamosa, affordable, and suggested a 20 percent cut in discretionary funding for the U.S. Department of Agriculture, a bedrock of support for many rural communities. Children play outside the new library in a former school that was renovated with help from the federal Community Development block grant — a program that may be cut under the Trump administration. 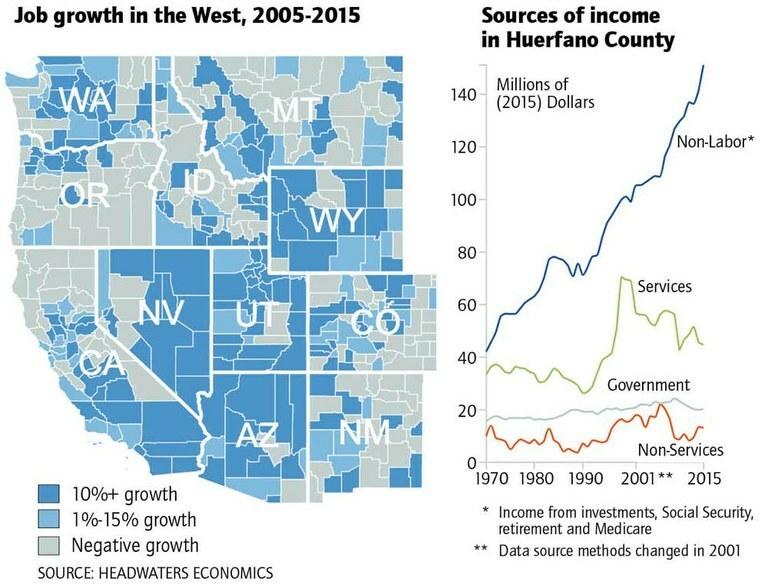 But the retirees who are making Huerfano County red are still buying real estate, and the Pew Research Center says 10,000 baby boomers will reach retirement age every day until 2030. The demographic shift and resulting political tension in Huerfano County hint at the uncomfortable questions in store for other rural places: How do people relate to those who disagree with them? How well do we understand our neighbors? If Huerfano County is any guide, the chasm between left and right in a town of 3,000 can be as vast as in a city of millions, and close proximity doesn’t equal understanding. Late one March evening, Sporleder lingered after a music rehearsal at the industrial-looking Feed Store Church in nearby La Veta, where she sings and plays piano every Sunday. An Israeli flag hangs next to an American one on the wall. The spirit after the election here was jubilant, Sporleder says; much of the congregation supported Trump. Mickey Schmidt, 62, the graying local post office master, sits quietly. He grew up in La Veta and has watched retirees and second-homers flock to the Spanish Peaks’ foothills, even as the nearby steel mill shed jobs. He sidesteps national politics, but observes that the tight-knit social bonds he knew as a kid have weakened over the years, leaving a community divided by more than just who voted for Trump. Different factions of people get involved in what interests them, he says, but there’s no central rallying point. 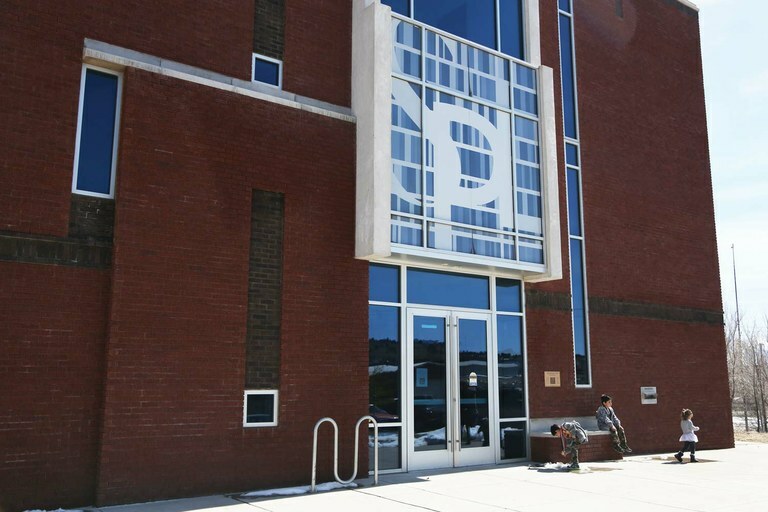 Once, that rallying point was the school, where enrollment has shrunk to 219 in 2015 from nearly 300 in 2007. That’s not true any longer, and the community spirit it embodied has shrunk, too. “The ‘take one for the team’ is not so much anymore,” Schmidt says. Leah Todd is a freelance reporter living in Taos, New Mexico. She has covered education for The Seattle Times and Casper Star-Tribune.